Christopher Columbus: The Discovery is a 1992 American-British-Spanish historical adventure film directed by John Glen. It was the last project developed by the father and son production team of Alexander and Ilya Salkind (best known for the Superman films that star Christopher Reeve in the title role). The film follows events after the fall of the Emirate of Granada (an Arab principality which was located in the south of Spain), and leads up to the voyage of Columbus to the New World in 1492. Its behind-the-scenes history involved an elaborate series of financial mishaps, which later brought about an emotional falling-out between Alexander and Ilya; as a frustrated Alexander would later lament in an interview with the Los Angeles Times, "I know, after this, that I'll never make movies again." The film was released for the 500th anniversary of Columbus' voyage. The premiere took place at almost exactly the same time as 1492: Conquest of Paradise, which has often led to confusion between the two films. The titular Genoese navigator overcomes intrigue in the court of King Ferdinand and Queen Isabella of Spain and gains financing for his expedition to the West Indies, which eventually leads to the European discovery of the Americas. Georges Corraface as Christopher Columbus. The role was originally intended for Timothy Dalton. Rachel Ward as Queen Isabella I. The role was originally intended for Isabella Rossellini. Timothy Dalton and Isabella Rossellini, originally chosen to star in the picture, backed out when director George Pan Cosmatos was replaced by John Glen shortly before shooting began. Dalton later filed a suit against the producers for breach of contract and fraud, stating that they did not provide a bank guarantee for his $2.5 million salary. Glen had previously directed Dalton in both of his appearances as James Bond: The Living Daylights and Licence to Kill. The film was not a commercial success, debuting at #4 and grossing $8 million against its $45 million budget. It won one Golden Raspberry Award Worst Supporting Actor – Tom Selleck, and was nominated for another five, including; Worst Picture, Worst Supporting Actor – Marlon Brando, Worst New Star – Georges Corraface, Worst Screenplay – Mario Puzo and Worst Director – John Glen. The film was released on VHS and LaserDisc formats from Warner Home Video. It has not been released on DVD in North America, but is available in other format regions on DVD. 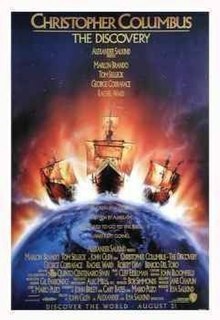 1492: Conquest of Paradise, another big budget, all-star epic about Columbus also released in 1992. Carry On Columbus – A comedy-film about Columbus released in 1992. The Magic Voyage, an animated film about Columbus also released in 1992. ^ "Columbus: A Filmmaker's Odyssey". Orlando Sentinel. Retrieved 30 November 2010. ^ "EPIC `1492' FILM CAPTURES ENERGY OF EXPLORER'S TIMES BEDEVILED VISIONARY Series: DISCOVERING COLUMBUS: 1492 – Second of Three Parts". Morning Call. Retrieved 30 November 2010. ^ Brennan, Judy (24 November 1993). "A Family Feud in Wake of 'Columbus' : Movies: Ilya Salkind has sued Alexander, his father and producing partner, for breach of contract, fraud and racketeering". Los Angeles Times. Retrieved 9 October 2010. ^ Mathews, Jack (15 May 1991). "Can Two Columbus Projects Stay Afloat?". Los Angeles Times. Retrieved 9 October 2010. ^ "Timothy Dalton". IMDb.com. Retrieved 29 March 2019. ^ Davidson, Casey (8 November 1991). "Dalton's Discovery". Entertainment Weekly. ^ Fox, David J. (25 August 1992). "Weekend Box Office `Unforgiven' at Top for Third Week". Los Angeles Times. Retrieved 1 December 2010. ^ "Revenues of Summer Movies Never Quite Fired Up Box Office". Sun Sentinel. Retrieved 1 December 2010. ^ Rainer, Peter (24 August 1992). "Columbus: Adrift at Sea With No Paddle". Los Angeles Times. Retrieved 9 October 2010. ^ Canby, Vincent (22 August 1992). "Review/Film; It's Goodbye, Columbus, As Torquemada Waves". The New York Times. Retrieved 9 October 2010. ^ "Christopher Columbus: The Discovery (1992)". Rottentomatoes.com. Retrieved 29 March 2019. ^ Brenner, Paul (n.d.). "Christopher Columbus: The Discovery". ArtistDirect. ^ Ebert, Roger. "Christopher Columbus: The Discovery Movie Review (1992) - Roger Ebert". Rogerebert.com. Retrieved 29 March 2019. ^ Ebert, Roger. "Ebert's Most Hated - Roger Ebert's Journal - Roger Ebert". Rogerebert.com. Retrieved 29 March 2019.